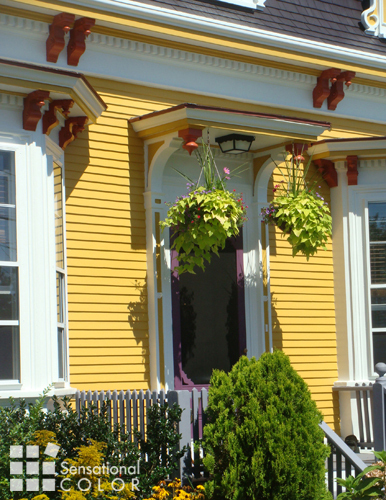 The attention to detail, the well thought out scheme, and bold use of color make this charming Victorian one of my favorites homes in Provincetown, MA. 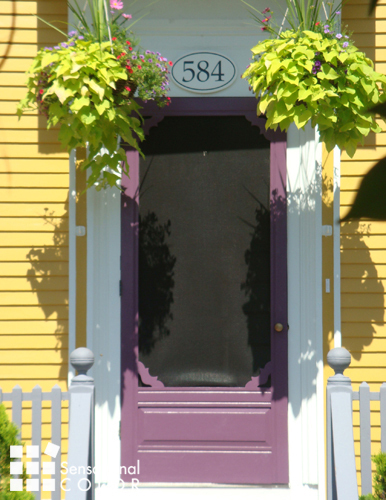 Here are the five reasons that make this adorable Victorian exterior color scheme stand out. While a color this strong might be disastrous on some homes it is exactly what this home needed to keep it from getting weighted down or lost under the roof. 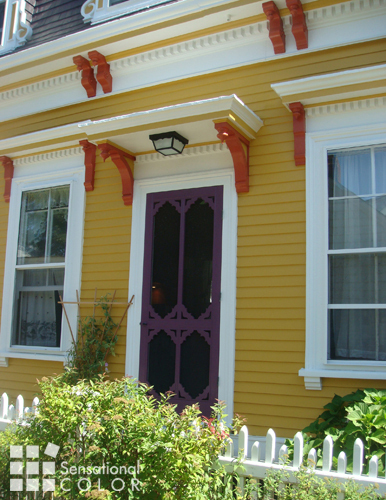 The bright gold was the right color choice for the main home exterior paint color. A dull or muted gold would have ‘aged’ this home in the same way using the wrong foundation color ages a woman. With a gold that is clear and clean rather than grayed or toned down painting the trim white rather than off white was the best choice. It looks crisp against the gold. The purple doors are perfect in both style and color. Purple and gold are complementary colors, which is one of the reasons that the purple stands out against the gold and creates a focal point on the home’s front and side facades. The purple is repeated in the flowers in the hanging arrangements that flank the front door. Thriving plants at the entrance of the home not only add color and texture but tells the world that the home is alive and being cared for. Since this property is on the corner you not only see the front door but also the side door. You can see how the homeowner has chosen a planter and trellis to the left of the door rather than repeating the hanging arrangements used at the front door. This helps to define the two entrances and keeps people from being confused about where the main entrance to the home is. 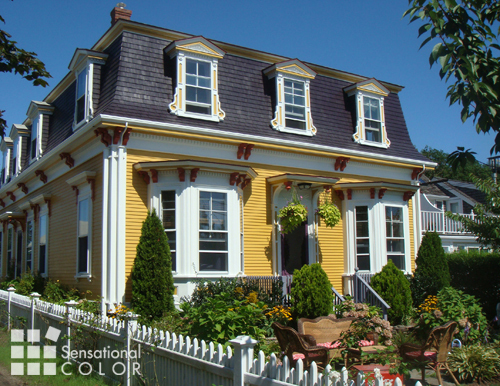 Although many Victorian home in New England today are painted all white during the era that these homes were being build bold color schemes that were inspired by nature were the norm for a home’s exterior. While many homeowners enjoy researching their home’s history and duplicating the original colors I prefer to look at the past as inspiration and choose colors befitting the home today. I believe that is the same approach these homeowners took when choosing their color palette. This scheme is build from the complementary color combination of gold and purple along with neutral gray. The red-orange may seem like an unlikely color choice for the accent color but I think if you were to try other hues with the gold and purple you would find that this is one of the most appealing choices. The right green could have also worked but because of the amount of green surrounding the home it would not have stood out as nicely. Are the colors on your home exterior this sensational? 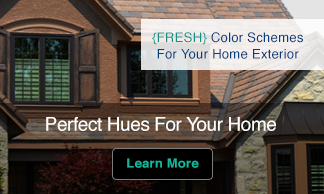 If not, you will want to download your copies of FRESH Color For Your Home Exterior eBooks. 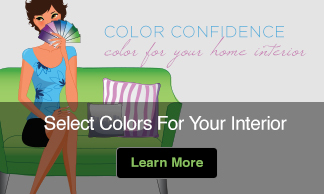 Following my five simple steps you will find the perfect colors for your home. Interesting that the orange is only on the brackets and not repeated anywhere else and it still looks fabulous! Great headline Kate, made me run over to look 🙂 and of course a house in my favourite colour is easy to love! Thanks, Maria. 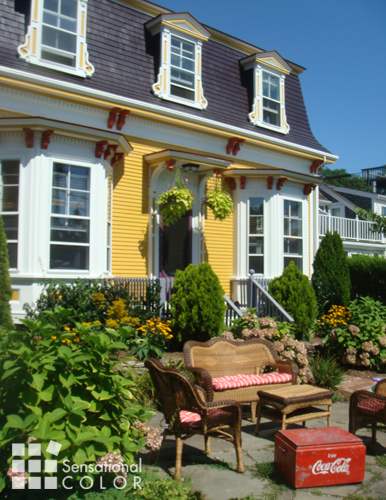 This is just one of many fabulous homes in Provincetown, MA. Stay tuned for more soon. Nice use of bold colors. I also like to paint my granny flat with such a nice color scheme. You can see the similar granny flat design here at grannyflatsolutions.com.au/new-south-wales-nsw/ Any suggestions will be appreciated. Oh! I’m so excited to give my 50’s rambler an updated look! This has given me hope to create that curb appeal it desperately needs. Thanks! How wonderful that you have been inspired by my post and pictures. That is the nicest compliment I can ever hear. Thank you!